Learn everything you need to set up effective marketing tracking for your business with this comprehensive guide. What’s inside this Marketing Analytics Blueprint? Learn about the two main categories of marketing tracking, how they’re different from each other, how they work together to give you a full view of what’s happening in your marketing campaigns, and how to set them up to get the most out of your tracking. There’s a lot you can do with marketing tracking, and trying to do it all at once can get overwhelming. Here’s how to use your campaign goals and the customer lifecycle to select the data you’ll analyze first. Collecting your data is just the beginning. Now that you know how various elements of your campaigns are performing, you can use that knowledge to make adjustments and improvements through split testing. Tracking and analyzing your marketing data can open up a whole host of opportunities. Here’s how using your marketing tracking data to make decisions can positively impact your business. Marketing tracking entails monitoring the actions that leads and customers take within your marketing campaigns. With data gathered from marketing tracking, you can discover which ads, landing pages, emails and other marketing assets your audience is clicking on, as well as what actions they take from there. 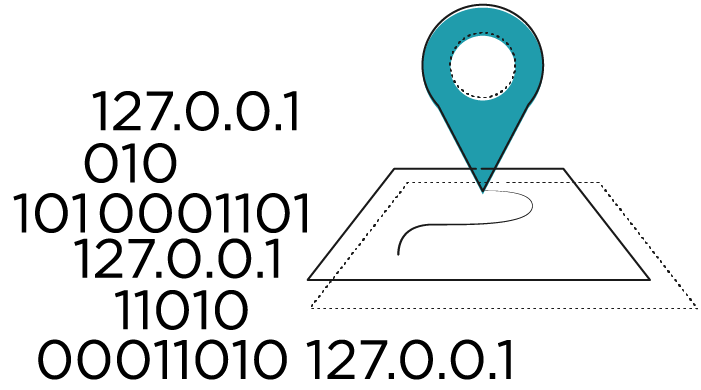 Tracking information is gathered from unique identifiers or codes on a person’s computer or web browser that are communicated to your marketing tracking system. Why Should I Invest in Marketing Tracking? Whether you’re a seasoned marketer or just getting started, you’re not truly marketing to your full potential if you’re not tracking. Putting time and resources into producing, launching and advertising marketing campaigns, without setting up a way to monitor what’s working and not, makes it nearly impossible to know how you can improve. If you’re currently running or thinking about running marketing campaigns for your business, investing in marketing tracking will give you the insight you need to understand the effectiveness of your marketing and to improve your results over time. Understanding your customers’ wants and needs is essential to earning their business, and the best way to determine where their interests lie is by tracking your marketing. According to Pronto Marketing, “When you find a particular advertisement, slogan or other marketing technique that sticks with them, build it up. You can incorporate it in promotional items, or inject it into your social media posts. Gauging your customers’ reactions helps you create a branding image that can last a lifetime.” This strategy works for anything — whether there’s a particular pain point that customers respond well to or you discover that they prefer pictures vs. illustrations. Gauging your customers’ reactions helps you create a branding image that can last a lifetime. The longer you have marketing tracking running on your campaigns, the more trends will show up in your marketing data. As you begin to notice these patterns in your results, you’ll gain the powerful advantage of being able to more accurately predict your future campaign results so that you can make better decisions for your business. For example, if you have one month to reach a campaign goal, you might go in after one week to evaluate how it’s performing. At this point, you can look at how many people have already converted, and use that information to calculate how many are likely to convert by the end of the month. This can help you understand if you’re on track or not and equip you to make adjustments accordingly. Spending money on advertising each month is difficult to justify when you’re not sure whether it’s working or not. With marketing tracking in place, you can save money by identifying your company’s top-performing (and least effective) advertising platforms and ads and adjusting your spend accordingly. Marketing tracking will show you which marketing strategies and techniques are working and which aren’t. Over time and with the right setup, you’ll be able to learn as you go and constantly adjust your campaigns based on your tracking results. For example, if your data shows that in nine out of 10 cases, sales pages with testimonials performed better than those without, you could safely predict that your next sales page will perform better if it includes a testimonial. Thinking your marketing efforts are going well is great, but knowing is better. Tracked marketing data is the evidence you need to prove the effectiveness (or ineffectiveness) of your campaigns to investors, executives and your team. Once you know which marketing platforms are outperforming others, you can choose to either dedicate time to optimize the underperformers, or stop spending money on them altogether in order to focus only on the platforms that are working. Then, as you begin to focus and optimize your marketing, you’ll see overall better results. Before getting started with marketing tracking, there are a few prerequisites that every business should already have in place: a fully-developed product and business, a website/landing pages, and ideally a CRM that collects and stores data. 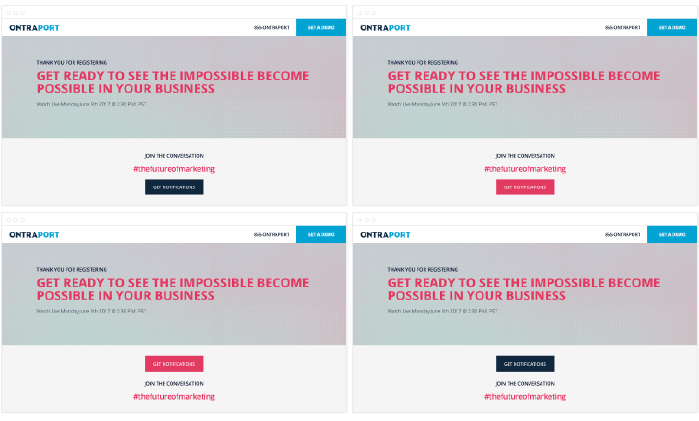 Are you using several single-point solution tools (such as LeadPages, MailChimp and Shopify) or an all-in-one platform (such as ONTRAPORT or Infusionsoft)? Before you begin tracking your marketing, consider the number of data sources that you’ll be managing. The more separate marketing tools you’re using, the more steps you’ll need to take to get all that data in one database to analyze — and the more difficult it will be to ensure your data is accurately synced. It’s also important to consider whether your marketing software has tracking features built in or if you’d need to purchase a separate tracking software. For best results, you’ll have to actually get involved with the data. This means taking the time to look at it, analyze it, and optimize on an ongoing basis. Many businesses have a team member dedicated to results analysis. However, even if you’re not at that stage yet, you can and should still set up marketing tracking so that your efforts are being tracked — you’ll be able to access that historical data whenever you are ready. This blueprint will walk you through the process of understanding, setting up and running marketing tracking. By the time you’ve finished reading each of the chapters, you will know best practices for using the right types of tracking at the right times and know how to optimize your campaigns based on tracking results. Running your marketing campaigns without tracking in place is going into marketing blind. Even if you’re not ready to analyze the data yet, ONTRAPORT Campaigns Director Sam Flegal says, “You should still prepare because you can’t get those numbers back. If you have no tracking, it’s lost data.” If you want the data to be useful and relevant, it’s important that you monitor it over a long period of time — ideally from the second you launch your campaign. 74% of marketers can’t measure or report how their efforts impact their business. In this chapter, we’re going to outline the key players involved in marketing tracking, how they’re different from one another, and how to set them up on your own campaigns. There are two main players in marketing tracking that you’ll want to introduce to each of your marketing campaigns: UTM variables and tracking scripts. They are not the same thing; however, they can (and should) be used at the same time. The main difference between tracking scripts and UTM variables is that tracking scripts show you how your audience interacts with your website, and UTMs show you how they got there. Think of marketing tracking like a store security system. When you walk into the store, the door you walk through beeps to let the clerk know which door you walked through. This is like UTMs, which keep track of where your campaign visitors come from. Once you’re inside the store, the security cameras are rolling and monitoring you throughout your entire shopping experience. This is like tracking scripts which, once set up, monitor your campaign visitors as they make their way through your campaigns. In any marketing campaign, you likely promote your sales page across multiple platforms, whether that is an ad you push into your prospects’ Facebook news feed, a banner ad on Google or a hyperlink in an email. Across all of these platforms, you’ll include a link to your sales page and, while the link destination is the same, if you add on an Urchin Tracking Monitor (UTM) variable, the text in each link will be different. A UTM variable is a series of tags that you attach to the end of your URLs to determine where the people who visit your pages come from. These tags are organized into five categories: campaign, lead source, medium, content and term. If visitors provide their contact information on a form on your page, this information is also stored in their contact record in your CRM system. Campaign (Required): When filling in the campaign category of a UTM, you’ll want to consider the name of the campaign you’re sending traffic to and what you want people to click on or opt in for. Lead Source (Required): This is where you fill in which platform or website your link will be placed on or where the leads are coming from. Some examples include Facebook, Google, email, blog, etc. Medium (Required): In what kind of format is the link contained? This is the medium on the platform that you used to link to. A social media post? A Facebook newsfeed ad? A blog article? Content (Optional): This variable should include identifying information about the specific content they clicked on. What version of an ad was it? What headline was it? What image did it have? What CTA did it have? This variable should be completely unique for each link. Term (Optional): This variable is generally used for search platforms and is where you would put the information about the terms you are bidding on. In Google, this can be the specific search term or keywords that a lead would use to find your Adwords campaign. You could also use it to identify the audience that you used for an ad on Facebook. The important thing to remember is that once you’ve set up the UTM structure for a specific URL, it’s crucial that you use the variables you’ve established consistently. Keep the spelling, spacing and capitalization exactly the same each time you use a variable, otherwise they will be tracked as two different variables. For example, facebook, Facebook, _Facebook and -Facebook would all be considered different variables, even though they are the same word. Once you’ve decided on the best variable structure for your campaign, you can put those variables into a UTM link generator. Click here to generate one now. If you are using ONTRAPORT to run your campaigns, there is a built-in UTM link builder on each page in the Tracking tab of your account. Based on all of this information, you might be wondering exactly when you should use UTM variables, and the answer is: any time you’re sending traffic to your own content. 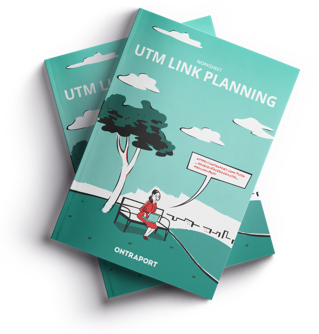 Whether you’re including a link to your landing page in a blog article, a social media post or an ad, it’s important to use a link with UTMs so that you can determine which of those sources are responsible for your landing page traffic. That allows you to measure the results of your time and money spent promoting your business via different channels. To track the leads who are visiting your landing pages, you’ll use tracking scripts, which are pieces of code that you add into the source code on each page (learn how to do this below). Tracking scripts allow you to see what’s holding your leads’ attention, what content they are responding to, how long they’re staying on your page, and how they interact with your site. Tracking scripts also allow your advertising or tracking platform to identify visitors to your site for retargeting purposes. One of the most popular and powerful tracking tools out there, Google Analytics can display in-depth stats about your website’s traffic. You can see how many total visits your site earned, how many unique visitors, the average session length, bounce rate and much more. It integrates with Google’s AdWords platform for measuring the ROI of your paid search advertisements. You can create a free account and place your own tracking code on your website to start gathering this data. Even if you don’t add any other scripts to your pages, Google Analytics is one you don’t want to live without. 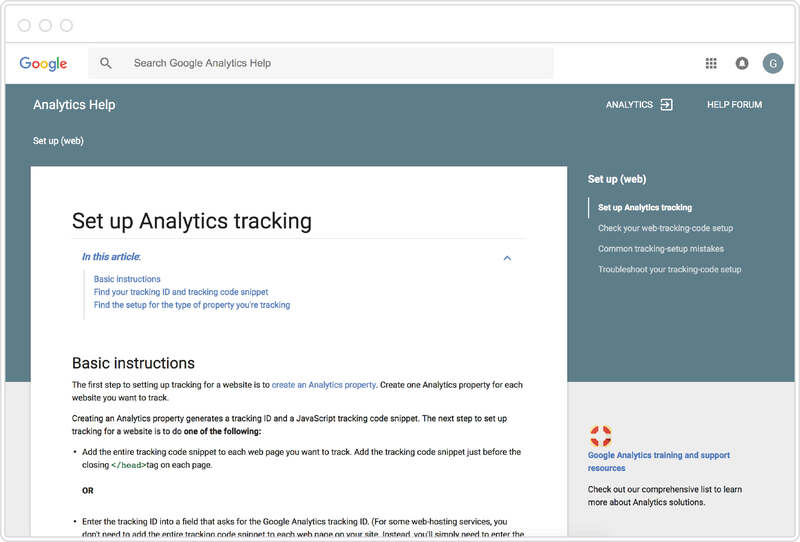 Click here for step-by-step instructions on how to generate your own Google Analytics tracking code snippet. 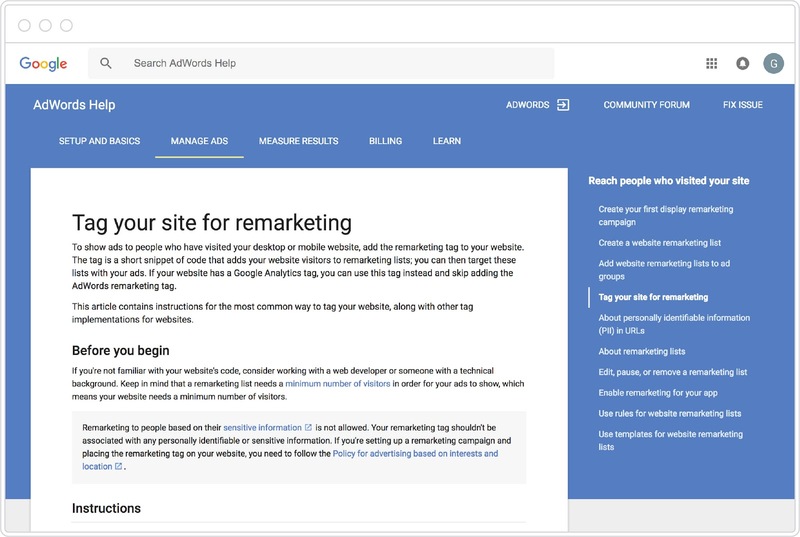 The Google Remarketing Tag allows you to retarget those who have visited your site with advertisements. It adds your web visitors to a remarketing list, and you can send ads to those on that list. For detailed instructions on how to generate your Google Remarketing code, check out this article. 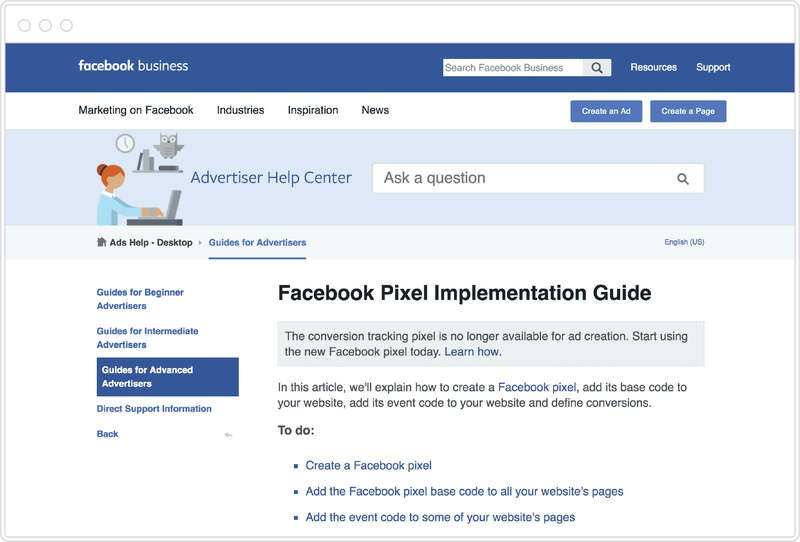 If you advertise on Facebook, adding their tracking pixel to your pages is a must. Facebook’s Pixel tracks visitors to your site and ties their data to any known Facebook accounts. This makes it possible to retarget those who visit your website, reducing your ad costs and increasing your conversions. Even if you are not yet running Facebook ads, if you think you may do so in the future, you should add this tracking pixel to your site so that it can start collecting visitor data for you to use in future advertising campaigns. You can also install event codes on your pages, which are, according to Facebook, “actions that happen on your website, either as a result of ads (paid) or not (organic).” Facebook has nine standard events that it tracks and then optimizes your ads for conversions. For step-by-step instructions on how to generate your own Facebook Pixel, click here. 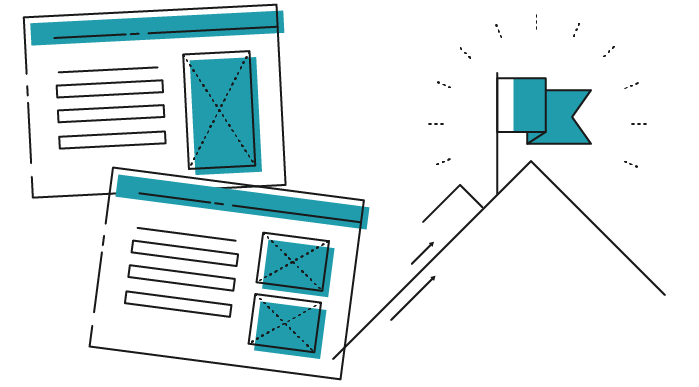 Adding tracking scripts to your page is straightforward — especially if you use a landing page creator on a platform like ONTRAPORT. You simply grab the code from whatever tracking tool you’re using (Facebook, Google, etc.) and paste it into either the custom header or footer code section. Technically, you can put the tracking script in either the header or footer of your pages, but we recommend putting it in the footer. Tracking scripts in the header prevent page images from loading first, so visitors will be staring at a blank white screen for longer, and the perceived load time is longer. This way, when you have multiple tracking scripts on one page, you can easily see which tracking script is for what. While this sounds like a lot of work — and it can be during the initial setup — after adding them to your pages, you’re set for life. You will not need to make changes to your tracking scripts. Once you’ve added tracking scripts to your pages, the scripts can then pixel your audiences — that is, they can place a little bit of code on your site visitors’ browsers (as long as they aren’t browsing in a private window or using AdBlock software). This is useful, especially in cases where a prospect is browsing your site and doesn’t fill out your forms to give you their contact information. Without tracking, a lead not filling out your site’s forms would be game over — but with it, you get a second (or third or fourth) chance at attracting potential customers back to your site without needing any contact information for them at all. As long as retargeting scripts are installed on your pages and people are accessing your site from a non-private browser, you’ll be able to target them with ads in the future with pixels. To begin understanding the extent that marketing tracking can improve your marketing results and add transparency to what’s working and what isn’t in your campaigns, we’ll walk you through an example. Let’s say you own a retail business called Ava’s Boutique that specializes in women’s clothing. Marina searches on Google for “spring dresses” and one of the first few search results is a blog article about five new dress trends for spring. She clicks on this link, reads through your article, then gets a pop-up asking her to fill out a form to sign up for your company’s newsletter. At this point, Marina will either choose to opt-in for your newsletter or not. Without marketing tracking, if she chose not to fill out your form, that would be the end of the road. You wouldn’t have any further chances to reach her with offers. But with your Google Remarketing and Facebook tracking scripts set up, Marina now has a cookie on her browser from your tracking script’s pixel that allows you to retarget her on other platforms. In this example, let’s say Marina did choose to opt in for your newsletter — and because your UTM variable tracked that she opted in after reading your article about new dress trends, an interest in new dresses has been added to her contact record. She later opens Facebook to check her news feed, when an ad for one of your newly released dresses appears. Excited, Marina clicks on the Facebook ad and heads back to your website — you know this because your UTM lead source told you she came from Facebook. After reading a couple of positive customer reviews and choosing which color dress she likes best, she decides to buy. She immediately gets a confirmation email in her inbox with her order details and shipping information. After receiving (and loving) her dress, Marina receives another email with the subject line “Refer and earn!” It’s a referral email from Ava’s Boutique with a personalized link for Marina to send to her friends. She forwards the link to her friends, who are equally impressed by your brand, and they make a purchase, too. Because you provided Marina with her very own URL for referring friends that includes a UTM showing that it’s her code, you’re able to attribute those sales to her referral efforts. Once your UTMs and tracking scripts are set up, they’ll begin to gather data on every action leads and customers take within your marketing campaigns. That raw data is used to calculate metrics that give you insight into the successes and failures of your campaigns. There’s a lot you can do with marketing tracking, but trying to do it all at once can quickly become overwhelming. Before you attempt to start tracking everything under the sun, take a step back to first consider your marketing campaign goals and where they fall within the customer lifecycle. Understanding marketing tracking in terms of the customer lifecycle turns analyzing your data into a step-by-step process. According to BigCommerce, “The customer lifecycle describes the various stages a customer goes through before, during and after they complete a transaction.” From a business owner’s perspective, the customer lifecycle gives you five stages to sort leads and customers into so that you know how to effectively nurture them to the next step. The customer lifecycle describes the various stages a customer goes through before, during and after they complete a transaction. Because each stage involves varying relationship strengths with your brand, you’ll want to look at different data for each one. During the Attract stage, also known as the “evaluation stage,” you’re working to initiate some form of relationship by making prospects aware of your brand. Essentially, this stage is all about introducing yourself and working to earn your new prospects’ contact information so you can keep in touch. Cookie/pixel them so that even if they don’t opt in for anything or give you their contact information, you can at least reach out to them again with retargeting ads. Get them to fill out a form with their contact information so that you can begin reaching them via email and SMS. During this stage, Facebook and Instagram ads are a good way to get your brand discovered by potential leads. To run ads on these platforms, you create targeted audiences based on interests or demographic information that matches your brand’s ideal customer, and Facebook and Instagram place your ads in people’s news feeds based on their matching criteria. You can also use search engine ads like Google to attract new leads, but these are run based on keyword searches and can get expensive depending on the keywords you choose to bid on. Because ads are such an integral part of this stage, many of the data points you’ll review will relate to the interactions people take with your ads. Click-through rate (CTR): This shows you how many ad clicks you get per impression, which gives you an idea of how interested the audience you’re targeting is. If you have a low CTR, chances are you’re either targeting the wrong audience, or you need to make updates to your ad copy or design. Cost per click (CPC): CPC is how much money your advertising platform gets paid everytime someone clicks on your ad. It’s a good idea to research what a high cost per click is for your industry so that you know when you’re paying too much. Average time on page: In Google Analytics, you can also look at what URLs and ads work better by tracking average time on page. This number is exactly what it sounds like — how long readers are staying on your pages — and a low average time on page can indicate a few things: either your ad copy is misleading and people who clicked didn’t get what they thought they would, or the page itself did not capture their attention. ROI and first click attribution: About three to six months down the line (once your leads have had time to move down the customer lifecycle into your Convert stage and beyond), check which ads have the highest ROI with first click attribution. The way you would do this is by looking at your existing customers and tracing back to their very first interaction with your brand — the cold ad that introduced them to your brand in the first place. This stage is for warm-to-hot leads. This is where the sales happen. Conversions or sign-ups. 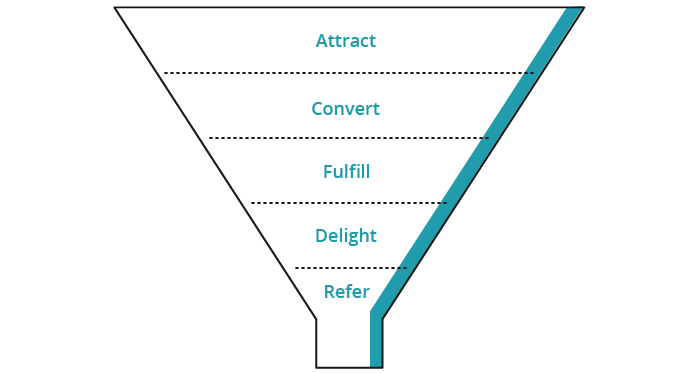 Although it sounds obvious, what “conversions” actually means will depend on your campaign’s end goal. It doesn’t necessarily have to be a paid purchase. For example, a conversion could be a sign-up for a demo, a product sale, or even an opt-in for a free trial. Basically, this number tracks how many customers complete a desired action. Number of opportunities includes anyone who is within your sales funnel or considered a sales qualified lead (SQL). Impressions: Brick Marketing says that an impression, “sometimes called a view or an ad view, is a term that refers to the point in which an ad is viewed once by a visitor or displayed once on a web page. The number of impressions of a particular advertisement is determined by the number of times the particular page is located and loaded.” If you’re paying for a high number of impressions but getting a low conversion rate, you know you’ll need to make some adjustments. Click-through rate (CTR): This is the same number that you tracked in the Attract stage, but this time you’re looking at it in a different way. In the Convert stage, you’re using CTR to determine opportunities — that is, the people who are interested and likely to convert. 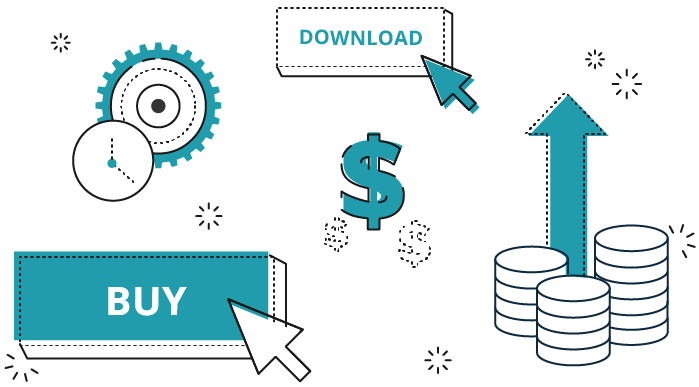 Cost per acquisition (CPA), according to BigCommerce, CPA “measures the aggregate cost to acquire one paying customer on a campaign or channel level.” This number is important to track because it shows you how each of your marketing campaigns are impacting your revenue. ROI: Find the return on investment by dividing the total dollar amount the ads brought in by the total amount spent creating and sending them. Campaign name: Name it something relevant so you are able to find it later. Source: This is where you’ll include the source of your email list or the type of email (e.g., “Hot-leads”). Term: This is optional for email campaigns but can be used to identify individual links (e.g., “Offer-1”). Content: This is also optional for email campaigns and can be used to track your individual leads with any field in your database (e.g., “user-id” or “user-email”). Now that your leads have purchased, it’s time to deliver on your promises and wow your new customers in the Fulfill stage. This is where you add more value, ensure your customers’ success with your product, and instill confidence in their choice to buy from you. Use your tracking to work backwards and determine what your typical happy customers have in common. Do the customers who stick around longer usually come in from Facebook ads rather than Google? Do they tend to come back for more if they read all your onboarding emails or schedule a demo with your sales rep? Email onboarding funnels that welcome and introduce new customers to your product or service. Look at the data you’ve already tracked in your database, including first-click attribution and engagement stats such as email opens and link clicks, compared to customer retention. You may find a correlation between customers who find your business on Facebook and customers who stick around for years. Or perhaps customers who engage with your emails are more likely to stick around than those who don’t? You can also directly ask your customers what they liked and didn’t like about your purchasing process with a customer feedback survey. Open rate: While open rates are one of the most unreliable forms of marketing tracking out there, it’s still a number to keep on your radar for one reason: comparing relative numbers. If you are used to an open rate of around 20% for product delivery emails and you suddenly drop off to 2%, this is a great indicator that there’s a problem with your funnel. Click-through rate: Are your new customers actually reading your onboarding content? Find out by keeping track of how many of them click on your linked resources. Conversion rate: As explained in the previous section, conversion rate does not have to mean a purchase — it simply means your customers took your desired action. In this case, it could mean your customers signed up for an onboarding call, took your online tutorial, or downloaded your guide to getting started with their new product or service. Conversion time: Knowing your conversion time, or how long it takes leads to go from opt-in to purchase, gives you an idea of how effective your marketing and sales efforts are. If you notice your conversion time speeding up, you can determine that you’re becoming more effective. Bounce/spam rate: If your emails aren’t getting through to customers, this could poorly affect your Fulfill stage — especially if you have a digital product that you deliver to customers via email. Product tutorials or training site: If you’re selling a more complex product that requires product tutorials or training, you can track activity on those pages with either a PURL or UTMs in tracked emails. One-on-one onboarding or welcome call: You can track what percentage of new customers schedule an onboarding call, how many show up, and their satisfaction with the call itself. Order fulfillment: If you ship physical products, you might include a printed card with a PURL that leads them to a training page. This way, even though it’s a physical product, you can track their engagement with your onboarding resources. The Delight stage is where you strengthen your customer bonds into long-term relationships and prime them to refer more business to you. It’s an opportunity to share upsell and cross-sell offers with existing customers. Usage: In order to get the timing of sending your upsell and cross-sell offers just right, you’ll want to know how much your customers are using your product and how committed they are, and also how long it takes to use it. Some ways to track this are through engagement back in the Fulfill stage, through opening emails and clicking on your email links and, of course, making more purchases. Upsell/cross-sell conversions: There are several numbers you should be using to track upsells and cross-sells including conversion rate, number of conversions, impressions, CTR, CPA and ROI. These are the same numbers listed in the Conversion stage, except this time it’s for an upsell/cross-sell offer rather than the core product. Email unsubscribes: When you send out your upsell or cross-sell emails, monitoring your unsubscribes is a great way to tell if your offer is on point or not. If you see a sudden spike in unsubscribes after sending out an upsell or cross-sell offer, chances are it’s because the product offered wasn’t a good match. Repeat customer rate: Tracking how many of your customers have made more than one purchase is a great way to measure how effective your Delight stage is with your existing customers. Purchasing frequency: The more often your customers buy from you, the better. When you monitor frequency, you can start predicting when your existing customers are due for another purchase and even send an offer email when the estimated time comes. Customer satisfaction: This can be tracked with a follow-up survey. Customer lifetime value (CLV): Tracking CLV, or the total amount of money a customer has spent on your business, is a great way to find out who your best customers are. If you’ve played your cards right in each other stage of the lifecycle, you’ll reap your ultimate reward in the Refer stage. The greatest value you receive from your customers comes not from their initial purchase or even their upsell purchase, but from the new customers they refer to you. Customers who were referred by loyal customers have a 37% higher retention rate. By the time you arrive at the Refer stage, your customers have been around for a while and already have a strong relationship with your brand. Now, your goal is to get them to recruit their friends and colleagues through word of mouth. First-click attribution on affiliate links: When you include affiliate information in the “campaign medium” portion of your UTMs, you can use first-click attribution to determine where your new customers are coming from. When you find that they purchased from a referral, you can reward the referrer accordingly. Number of purchases from referrals: Find out who your top referrers are by keeping a tally of purchases. Participation rate: Keeping track of how many customers are actively referring your business from month to month is a great way to measure the success of your referral program. If your number of active referrers is steadily climbing, you’re in good shape. Affiliate link impressions: The more people who click on your partners’ affiliate links, the more potential customers are becoming aware of your brand. This also will give you other important insights such as the conversion rate for your individual referrers. Once you’ve been tracking and analyzing your data for a while, you’ll begin to notice patterns in your marketing. Whether they’re good or bad, they’ll give you insight into how you can improve your campaigns and strategies in the future. Here’s how you can use the data you’ve gathered and studied to improve your marketing campaign results over time. When you look at the “campaign” category within your UTM variables, you can quickly see which campaigns are earning you the most link clicks and engagement. For example, if you’re running five advertising campaigns on Facebook but only have the budget to keep spending money on four of them, you may pull up the UTMs related to those five campaigns, and cut the campaign with fewer conversions or engagements than the others. If you want to see where your leads were when they entered your campaign, this is the section of your UTM variable to pay attention to. Knowing this information can help you to understand which lead sources are and aren’t worth your time, which ones may need some strategy improvements, and which have brought you your most loyal customers. The difference between the information you get from lead source and medium is mainly noticeable on platforms such Facebook and Twitter, where there are multiple categories within each one. For example, having Facebook as a “lead source” won’t tell you everything you need to know if you run both Facebook news feed ads and regular posts. Being able to check if your Facebook ads are outperforming your boosted Facebook posts is important and will allow you to make effective decisions about which mediums to stick with. This category allows you to figure out which types of content perform better than others. With split testing, for example, you may have named one version of your content “salespage_photograph” and the other “salespage_illustration” to track which version got better numbers. Knowing this information allows you to optimize accordingly and start testing other elements of your campaign’s content. This category can give you detailed information about which keywords and audiences are and aren’t working within your individual campaigns. For example, if you’re running a Facebook ad campaign for women’s clothing containing nine variations of an ad, you can use the “term” category to narrow down your winners based on audiences. Let’s say you started out this campaign targeting three different groups of people. Your audiences are female college students, female working professionals, and stay-at-home moms. When you look at your UTMs for this campaign, the “term” category can help you decide which audiences to eliminate and which ones to keep. Some marketing automation platforms, such as ONTRAPORT, track both first- and last-click attribution using the data gathered from UTM links. First-click attribution refers to the first link someone clicked on that led him or her to join your database — showing what converted the person from a prospect to a contact. This is helpful in organizing information such as affiliate commissions or if you want to know which specific lead sources are most successful in obtaining leads. With last-click attribution, the last link a person clicked on before converting gets credit for the sale. This is helpful in understanding which of your assets are most convincing in driving sales, giving you insight into which assets to direct future ads and links toward. When you’re able to focus on only the platforms, mediums, campaigns and content that perform best for you (or make improvements to the ones that weren’t working), you’ll start spending less money on things that aren’t working for you. If no matter what you do, your data consistently shows that one platform isn’t gaining momentum like the others, you might decide to adjust your plan, cut your losses and start focusing your time on more effective platforms. Or, if you’re finding that certain types of emails get more link clicks than others, you might be able to create a template from it that cuts your email writing and designing time in half. The longer you track and analyze your marketing data with UTMs, the more you’ll adjust your strategy to avoid setups that hurt your results and, in turn, you’ll end up with better marketing campaign results. While UTMs and tracking scripts allow you to understand your traffic sources and actions, you can also gather information about what’s working and not working in your marketing through split testing your marketing assets. Split testing allows you to pit another version — or multiple other versions — of a page, email or other resource against your original to see which one encourages visitors to convert at the highest rate. 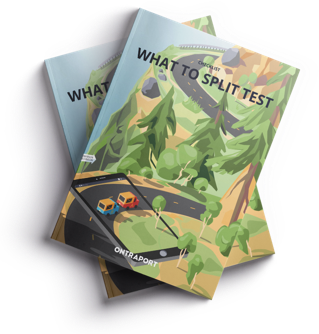 Running a split test is neither as complicated and time-consuming as many business owners think nor is it something reserved for marketing gurus in search of the latest conversion-boosting trick or craze. It’s something everyone can and should be doing as much as possible. I’m of the opinion that you should be testing everything all the time, every minute you spend not testing something is a minute that you’re potentially taking a loss. Getting started with split testing can seem overwhelming, but once you understand the types of tests and determine what’s right for your business, actually implementing the automated tests in your marketing automation platform is simple. 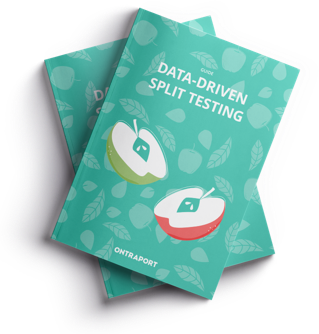 First, let’s get clear about what split testing is: Split testing is dispersing your traffic evenly across multiple versions of a marketing asset, such as a landing page, email or form, to measure performance side by side. With a marketing automation system, your traffic is split automatically so that, for example, half of the people who click on your ad will go to one version of a landing page and the other half will go to the other version of the page. You can then compare which page prompts more visitors to achieve your goal — whether that is watching a webinar on the page, clicking a link, making a purchase, filling out a survey form, or any other action you designate. There are two primary methods of split testing: A/B and multivariate. It’s important to note that A/B testing is not synonymous with split testing; A/B testing is one type of split test. A/B testing involves changing a single element of your asset. You’ll split your traffic between two versions — your original and your new version — with one element that’s different. 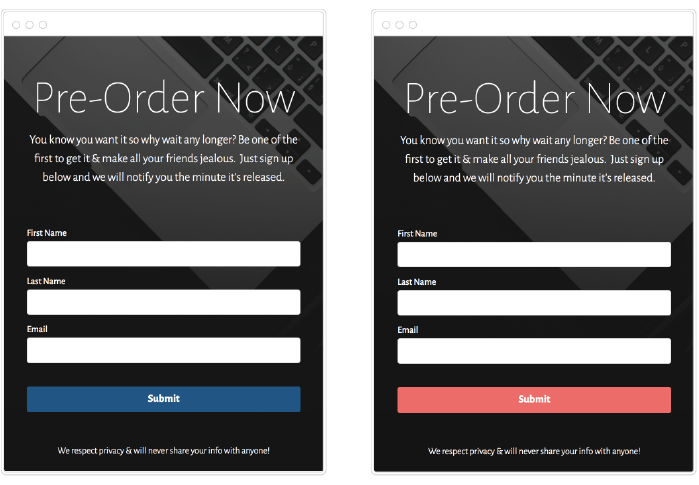 For example, if you only change the color of the call-to-action (CTA) button on a form and everything else stays the same, you’re performing an A/B test. Multivariate testing is changing multiple elements of your asset. For example, if you want to test both the location and the color of the CTA button, you’ll have four versions of your asset to fairly encompass all the combinations (pink button at top, pink button at bottom, blue button at top, blue button at bottom) that could occur. As with any experiment, there are a few ground rules to follow to ensure your results are accurate. If your results aren’t valid, you can’t rely on them and, therefore, the test won’t be of any benefit to you. As with any aspect of marketing, there are always variables in split testing — you’re dealing with people, and people are affected by emotion, which is unpredictable. This is where having a control group for fair testing comes into play. If you are running an A/B test, it’s important to test only one variable at a time so that you can draw accurate conclusions about what is causing one version to perform better than the other. If you’re performing multivariate testing, you’ll need to test all the possible combinations that could occur. It’s common for people to test multiple elements but perform the test like an A/B test — only running two versions — which doesn’t elicit useful data because you can’t confidently say which element change is contributing to the change in performance. Following the multivariate example above, if you were to only run the pink button at the bottom of the page and the blue button at the top, you won’t know why the winner won. Was it the color, or was it the positioning? A common mistake people make is turning off their original page and introducing a new page, then comparing historical versus current data. This isn’t a valid comparison because the time of month, week or season could have an effect on results and you’d have no way of knowing whether the results were caused by timing or by the elements you were testing. It’s possible your buyers are more active in the summer or perhaps mid-month when they receive their paychecks. Timing is a factor that should remain steady in order to accurately review your data. Statistical significance tells you how certain you can be that your results will hold true for the long-term. The calculation factors in the size of your audience and the number of conversions; you need a large enough size audience with enough variance in your data — one page has to outperform another by a large margin — in order to have statistically significant results. While the industry standard level of statistical significance to aim for is 90-95%, if you’re a small business without a ton of traffic, it’s probably safe to make a call once you reach 80-85%. Once your results are deemed statistically significant, you can choose to turn off the version of your page that isn’t converting and optimize the page that is. You can determine your statistical significance easily by entering your audience and conversion numbers into online calculators, such as this one from Kissmetrics. With A/B testing, you’re making incremental changes over a long period of time to improve results gradually. With multivariate testing, you’re making larger changes over a shorter time frame to see results more quickly. While split testing brings potential for vast improvement in your results, it also comes with a risk of worsening your results. Say half your traffic is going to Page A, which converts at 20%, and half your traffic is going to Page B, which converts at 10%. You’re losing out on potential conversions by sending traffic to the lower-converting page. However, you can always turn off versions that aren’t performing well and introduce new versions that could turn your results around for the better. If your marketing assets don’t receive a lot of traffic, you won’t have as much data to base decisions on, and it’ll take much longer to get statistically significant results. This is especially true if you’re running multivariate tests because you’re splitting your traffic among a higher number of pages, forms or emails. If you don’t have high traffic, stick with A/B testing so that you’re able to garner actionable results. If you’re planning to run a split test over a long period of time, A/B testing will suit you well. On the other hand, multivariate testing allows you to find the best version of your page faster, especially if you have a sufficient budget to advertise and bring in a high amount of traffic to increase conversions more quickly. No matter what type of test you’re running, it’s important to monitor results throughout the duration of your campaign so that you can make adjustments as needed. You can test any element on your marketing assets — but focus on the ones you think will make a difference based on your audience and other marketing results. Split testing is worthless unless you take action from what you learn. Optimization from split testing usually entails removing and replacing parts of your campaign to get the best possible conversion rate for the least possible spend. Here are five steps for optimizing your campaigns in the most efficient way possible. For your first test, start with an A/B or multivariate test with only four total options. Choose to test something that can have a big impact such as the headline or the location of the form on the page. Run your test until you have statistical confidence that one of the versions is the winner. The winner is now your champion. Introduce a new challenger version. Change one more element on the page and run another test. Run until you have statistical confidence. Whichever version wins is the new champion. If you want, you can increase the proportion of the traffic you’re sending to this version since you now have more confidence that it is a high performer. Repeat as many times as possible before the end of the campaign. As you continue introducing new versions, you need to have some idea of why the winner won in order to iterate and improve. Try to see your landing page from the eyes of one of your leads or customers: What was more appealing about the version that won? Maybe moving your CTA up higher on the page made it easier to see so more viewers responded to it. Maybe one headline was more effective than another because it focused on a pain point that is more significant for the audience. Even if you are wrong, you need a theory in order to run more tests. You will use this hypothesis to shape your next test. If the outcome disconfirms your hypothesis, then come up with a new one. If it was supported, then try and add onto it. To do this effectively requires thinking like a psychologist to understand the reasons why people are behaving the way they are. As you run test after test, even if you aren’t highly skilled at accurately predicting people’s behavior, you will gain valuable objective data, and your predictions should improve over time. One of the best things about testing is just how much you will learn about your audience. Everyone has assumptions, and sometimes proving them wrong can turn out to be highly valuable to your business. Adding tracking to your marketing campaigns gives you the insight you need to not only understand the effectiveness of your marketing, but also begin to make data-driven decisions that move your business forward. There’s a reason behind every decision you make and, in marketing, these decisions can either be made because you had a gut feeling or because you had a long history of data trends to support it. As you may have guessed, making decisions without data to support them is a riskier choice and could result in wasted budget and lost time for you and your team. Data should be at the heart of strategic decision making in businesses, whether they are huge multinationals or small family-run operations, companies engaged in data-driven decision-making experience a 6% increase in the productivity and output of the company over the companies that do not. Knowing where your strongest customers and leads come from, learning their purchasing habits, and figuring out what they’re interested in is the best way to understand your customers and tailor your marketing to them and their needs. When your customers feel catered to, they feel special — creating an experience that keeps them coming back for more. Data-driven marketing helps businesses deal with new information and improve the quality of their products and services to keep up with chances in the marketing environment.